A Plymouth lad who is especially proud of his city and club, Paul Wotton rose through the Argyle youth ranks to captain the side to two championship titles. 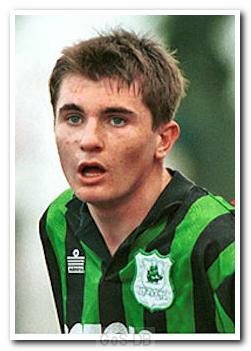 He made his debut in 1995 at the age of 17 and became a first team regular at the start of the 1997-98 season. 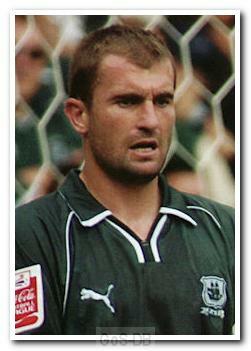 In 1999 however, he looked to be leaving to join Northampton Town, a move that fortunately fell through. Wottsy was named as club captain for the 2001-02 season, played every second of the campaign that led to the Third Division title and was named in the PFA Division Three team of the year. An inspirational leader and a versatile player, he started his career at centre-back but later moved into central midfield. He had a ferocious shot and scored many important goals, often from free-kicks or the penalty spot. He was twice voted Player of the Year, first in 2002-03 and again in 2004-05, when he was also leading scorer. Despite twice losing his place to Hasney Aljofree, he played a huge role in the Division Two championship winning side of 2003-04 and lifted his second trophy as Argyle's captain. In his 2005-06 testimonial season he was virtually ever-present, again finishing as top scorer, and was rewarded with a new three-and-a-half-year contract and a testimonial match against Anderlecht. After an excellent start to the 2006-07 season, Wotton suffered a cruciate and medial knee ligament injury in December and did not return to the first team for 14 months. 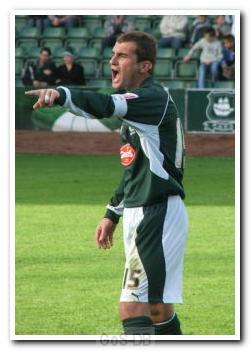 He made just eight more appearances for Argyle and was released after 14 seasons with the club, but not before scoring a trademark penalty in his final game. He then joined Southampton, where he made more than 50 appearances in two years. In November 2010 Wotton had a short loan spell with Oxford United and the following month joined Yeovil Town in a similar deal. An agreement to cancel his contract was made with Southampton and Wotton joined Yeovil on a permanent basis in January 2011. After playing 43 games in just over a year at Huish Park, his contract was cancelled by mutual agreement, enabling him to return to Argyle. Wotton was virtually ever-present for the remainder of the 2011-12 campaign and made a predictably large contribution to the successful fight for league survival, showing that he had lost none of the passion and desire to play for his hometown club that had been the hallmark of his first spell at Home Park. Picked by John Sheridan in the starting XI for the opening fixture of the 2013-14 season, away at Southend United, he broke a rib in an accidental collision with Luke McCormick, which kept him out of the early part of that season. At the end of the 2013-14 campaign, when his contract expired, Wottsy signed a further one-year deal to be retained as a player, but he was also given new coaching duties (he possesses the UEFA 'A' coaching licence). However, his playing days were effectively over; his last game, on 3 May 2014 at Portsmouth, came more than 19 years after his first, and in terms of his first team playing days, he heads the all-time chart: more than 15 years on the team-sheet (see footnote). In terms of appearances, his last game drew him level with Sammy Black on 491 games, with only Kevin Hodges (620) having played more for the club. At the last home game of the 2014-15 season, having concentrated on his coaching role throughout the campaign, Paul was presented a silver salver by chairman James Brent in recognition of his extraordinary service to the club. A fortnight later, the end-of-season retained list confirmed that his playing days were over, but he was retained as first team coach by new manager Derek Adams. Footnote: by "more than 15 years on the team-sheet", we mean the overall time between his first and last games, including periods of injury and summer breaks, but excluding his time as a youth (before his first team debut) and when he was not on the Argyle books (i.e. playing for another club). See here for the all-time chart. Much like his great friend Michael Evans, Paul Wotton is a hometown hero who grew up in front of us in his Argyle shirt, coming back from early heartache after a tearful relegation face-off against Burnley in 1998, to lead his team to the heights of two League Championships, becoming a two time Player of the Year, and a Hall of Famer with more than 400 first team appearances to his name along the way. A no-nonsense defender with a fearsome shot and an incredible record at penalties and free-kicks, his uncompromising style won him the affection and respect of the Green Army - the fans on the terrace knew that at least one of the team that they were watching had the same love and respect for the green shirt as we did. That genuinely mattered, certainly to the majority of us, if not those few that never seemed able to forgive him for going on trial to Northampton in his early days. 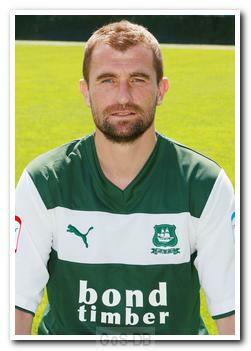 After leaving Argyle in 2008, like Mickey Evans, he found his way home again in 2012. Unlike Mickey, he returned to an Argyle in chaos on and off the field, with the prospects for a positive outcome for his second spell being somewhat limited by the damage wrought by poor off-field management. Nonetheless, despite the inevitable slowing that age brings, his presence in the team guarantees one thing - spirit, heart and devotion to the cause. Who knows - one day he may well be able to utter those famous words once again. "We've only gone and done it".